Sure, paradise is paradise no matter when you travel, but there’s something extra special about leaving behind the winter chill for a glorious Caribbean getaway. So trade your gloves and scarves for sandals and swimsuits, and swap out white snow for white sand at Nassau Paradise Island, where winter is the perfect time to hone your tanning skills. In The Bahamas, Junkanoo days are the most exciting days (okay, nights) of the entire year. 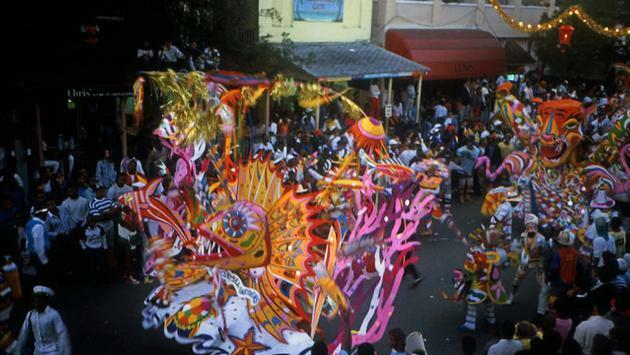 Watch as Bahamians don colorful costumes and “jump in da line” until the early morning hours during this annual celebration. Parades take place nightly from December 26 through January 1, beginning around midnight. If you’re a runner, you won’t want to miss Marathon Bahamas, which takes place January 13-14. There’s a friendly atmosphere during the event, which includes a full marathon, half marathon, 5K and relay—and the scenery along the course is second to none. See you at the starting line. Who has time for the beach, when Nassau Paradise Island’s golf courses and tennis and racquet clubs beckon? Combine endless sunshine with two gorgeous, challenging golf courses and numerous tennis courts, and you’ll find plenty of ways to indulge in your favorite sport. Not a pro? Sign up for lessons to help improve your game. While it might be challenging to gift wrap a Nassau Paradise Island getaway and place it under the tree, you’ll be the hit of the holidays if you try. Go ahead and treat yourself as well. You deserve it. Because sunlight is known to boost your immunity, improve your mood and lower the risk for certain diseases, you really owe it to yourself to get enough Vitamin D during the winter season. So really, you’re doing yourself and your health a favor by booking a trip to Paradise. Yes, you can celebrate good times this holiday season with Kool and the Gang, who perform at the Imperial Ballroom at Atlantis, Paradise Island is on December 30. Or ring in the new year with Sting on December 31. The evening includes complimentary beverages all night long for a New Year’s Eve you’ll never forget. No cooking, no cleaning, no muss, no fuss. Instead, unwind in The Bahamas with first-rate dining, lavish accommodations and plenty of exciting activities. You’ll have so much fun, this might be the start of a brand new holiday tradition. If you’re already a fan of Nassau Paradise Island, you’ll want to explore the new resorts and tantalizing restaurants that are cropping up alongside your favorite haunts. From the opening of Baha Mar—the most buzzed-about resort debut in the Caribbean—to a new celebrity-owned restaurant by Jose Andres, to the arrival of Bahamian favorite Sip Sip, you’ll definitely want to set aside time to explore all that’s new. While Paradise has no lack of activities this winter season, don’t feel guilty if you’re all about chilling on the beach with a good book. With sunny skies almost every day of the year and long stretches of white sand beaches, Nassau Paradise Island is perfectly suited for lounging. Heck, stay for a week and sample every single beach if you like. Ready to visit? There are plenty of savings to be found during the winter season. No matter whether you prefer a boutique hotel, an oceanfront resort or a luxurious retreat, there’s bound to be a Nassau Paradise Island travel deal for you.